Are you using your mobile too much?? Nearly all of us have wireless devices and with Christmas fast approaching much of our shopping will be done “on line” using mobile phones with the kids spending more time sitting slumped on a bean bag playing or texting for hours without moving. Chances are you are reading this with your head down, shoulders rounded and even legs crossed, putting yourself into that “text neck” risk position. 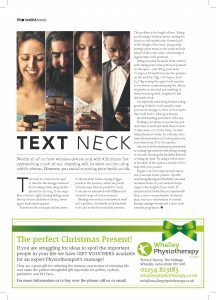 Text neck is a coined term used to describe the damage sustained from looking down using mobile phones for too long. It can range from a chronic, tight, burning feeling across the top of your shoulders to sharp, severe upper back muscle spasms. Sometimes the neck pain radiates down to the shoulder blades causing Trigger points in the muscles, which are points of exquisite tenderness that are painful to touch. It can also be associated with stiffness and a limited range of neck movement. Bending your neck to look down in itself isn’t a problem, it’s what the neck was made to do and is vital for most daily activities. The problem is the length of time. Sitting poorly using a wireless device, texting for hours on end results in the forward pull of the weight of the head plus gravity putting undue stress on the joints and soft tissues of the lower neck, contributing to degenerative neck problems. Sitting slouched forwards of the vertical with unsupported arms puts most pressure on the spine; just tilting your head 15 degrees forwards increases the pressure on the neck by 12kg, a 60 degree bend by 27kg causing the upper back muscles to overwork counterbalancing the effects of gravity on the head and resulting in them becoming tired, lengthened and ultimately weak. This position is often accompanied by forward shoulders and a rounded upper back, which in turn leads to shoulder problems. It is especially concerning because young, growing children could possibly cause permanent damage to their cervical spines that could lead to lifelong neck pain. As with anything prevention is the key. Holding your phone at eye level so you don’t have to bend your head down to view it takes away a lot of the strain. As does taking frequent breaks, for example, set a timer or alarm that reminds you look up and move your head every 20 to 30 minutes. Also try to avoid unbalanced postures such as crossing legs unevenly while sitting, leaning to one side, hunching the shoulders forward, or tilting the head. As muscles tire, slouching and other poor postures become more evident putting extra pressure on the neck. Try using a rolled towel in the small of the back as a lumbar roll to help with your posture. Regular exercise helps prevent injury and promotes better posture. Specific neck strengthening and flexibility exercises minimise strain on your neck and helps support the weight of your head. Try Chin tucks – a double chin nightmare but great as it strengthens the neck muscles and pulls the chin into alignment -Sit tall in a chair keeping chin parallel to the floor. Look at something directly ahead and gently draw the head and chin back without tilting your head in any direction. The importance of a balance of core and back strengthening exercises is often overlooked as these muscle help support the upper body and neck. If symptoms don’t settle then you may benefit from a more comprehensive treatment plan, such as a combination of manual therapy, massage therapy and a tailor made exercise programme.